I’m glad to report that I spilt very little, if any of my soups. 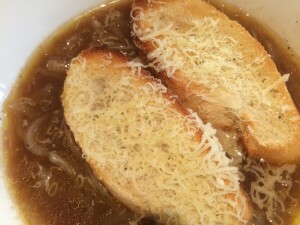 First up was this simple but very tasty French onion soup, inspired by the fact that there were a lot of onions with no particular plan in mind. It was soup or a tart. No time to make pastry, so soup it was. It took me right back to my summer holiday in France. The other one was a real favourite of mine – it’s a salmon chowder, with a grated potato, chopped red onion, chopped red pepper, sweetcorn, fish stock, a bit of cream, parsley and served with a little diced cucumber nestled in the bottom the the bowl. And some salmon, obviously. The second night I added some prawns, to make it stretch for an unexpected guest – very lovely indeed. 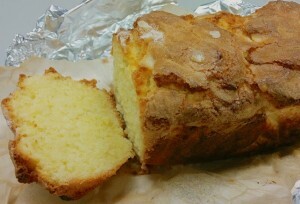 I also made this – Nigella’s simple yet excellent Madeira cake. I got away with being late for work, by explaining that my excuse was that this took a little longer to bake than anticipated – how could they complain when I got up early to bake them a cake (although clearly not early enough)? ?